Above average turnover but still low volatility for the EUR/RON on Friday which closed just below 4.6700. The EM backdrop looks slightly improved this morning but this shouldn’t change the picture locally and we look for the same 4.6600-4.6700 range for the EUR/RON. 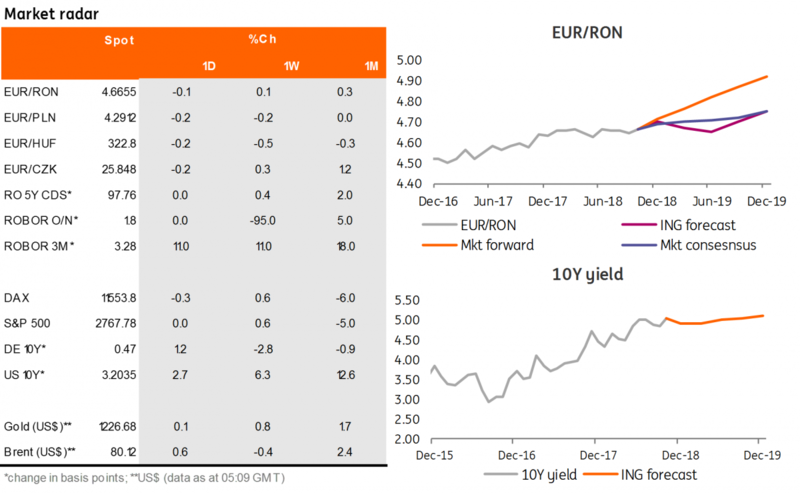 A quiet mood in ROMGBs these days with the yield curve little changed on Friday, apart from the Ministry of Finance latest auctions which managed to stir the waters to some extent. Today we could see again a similar episode as the MinFin plans to sell RON500 millions in Apr-2024 bonds. While the tenor is at the upper bound of ALMs traditional interest, the latest positive surprises in primary market auctions could attract some decent demand again. Needless to say that clustered bids will likely tempt the MinFin to upsize the allocation, which we expect to be around 4.85% average. Overnight implied yields continue to trade only slightly above the deposit facility of 1.50% but all the other tenors covering the next reserve period are trading above the Lombard rate of 3.50%. That’s quite a bit of uncertainty priced in. While a repo auction today could calm down the market to some extent, the breakdown is a bit tricky with two days covering the current reserve period (for which we see excess cash in the system) and five the next reserve period when a liquidity deficit is expected. Hence, we could see the NBR opting for no repo today and wait for the next week to inject liquidity. For the week ahead the US data highlight will be 3Q GDP, with another strong outcome looking likely. We look for US growth to come in at an annualised 3.6% rate versus the 3.2% consensus and the 4.2% outcome from 2Q18. We continue to look for a December interest rate rise followed by three more in each of the first three quarters of 2019. Despite increased downside risks to the eurozone’s growth outlook, the ECB will not divert from its chosen course to bring QE to an end in December. We expect a slightly more dovish, but still highly determined Mario Draghi at this week’s ECB meeting. No major data expected on the local front and we look for the EUR/RON to trade between 4.6500 and 4.6700.